Slade House will be released Tuesday, October 27th - just in time for a perfect Halloween read! 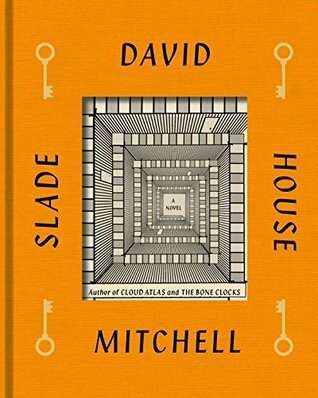 Slade House by David Mitchell. Random House; 2015. 224 pages. Hardcover/Hardback. First off, I want to point out that apparently Slade House is set in the same world as The Bone Clocks, which I have not yet read. This did not appear to impact my enjoyment of the book at all, but I can see how having a more solid understanding of the world may lend to a bigger appreciation of the story and understanding of certain terms, especially in some areas near the end. Secondly, I am keeping this review fairly brief; I think Slade House is best read when you don't know much about it going into the story, so I don't want to go too in depth about the details. I loved this book immensely! I enjoy a good scary story, but I'm slightly picky about them. I'm not a big fan of excessive gore, violence, or gross factors that are so prevalent in horror books and movies. It's not that I mind violence, as it works well in many books, but it so often becomes overused in scary stories. I'm more of the psychological thriller fan; I prefer to have my mind messed with. I think the creepiest and scariest books occur when thing are left unsaid, or when the creepy factor is so subtle you don't realize it, and when you do you're so unsettled you don't even know what to do. Think House of Leaves by Mark Z. Danielewski or The Turn of the Screw by Henry James. Slade House fits this mold exceptionally well, which made it an extremely enjoyable read. I will briefly sum it up as this: Slade House spans five decades and centers on a house that come and go every nine years, luring in only those who are useful. I don't want to say any more than that for fear of giving anything away. I finished this book in a matter of days; I simply did not want to put it down. As mentioned, it masterfully covers the years from 1979 to October 31, 2015, and is told in such a way that each decade and its character's perspective is immensely gripping and interesting. Mitchell has created such an engaging, unique world that becomes entirely tangible to his readers. In order to enjoy this book, you do have to suspend your belief at times, but the best part is: so do his characters. Everything is whacky and uncertain, and you just have to hang yourself in suspense while you wait to see how everything will work. With each new character that is introduced, I felt a tiny sense of foreboding that slowly grew as each one began to make their ways towards the tiny little alleyway that would lead to Slade House. Each character has a very unique personality and background, but each one seems to make the same mistakes and sets off a similar chain of events, which I found quite interesting to explore. I think this is a book that is perfect for going into without knowing much about it. Much like Slade House itself, you just have to stumble inside and become lost as you attempt to make sense of where you are and what you're reading. So go ahead and sneak in through that tiny little iron door on Slade Alley and immerse yourself in this new, disconcerting world. Overall, I am giving Slade House the big five stars! I had such a great time reading this book and I flew right through it, entranced the entire time. I would recommend this book to anyone in need a good spooky house story or a bit of psychological intrigue. O.O This book sounds insanely good, though I'm not sure if I should read it. Will it give me scares? I like sleeping at night when I'm not reading! However, I love that you mentioned this book is a psychological thriller. If I had to pick one of the two horrors, blood/gore or suspense/thriller, I'd pick the latter. Much more subtle yet equally creepy.